About a quarter of Brattleboro's electricity comes from the Canadian dams that Native Americans are fighting. Activists are focusing on stopping logging on publicly owned land. Banning clearcut logging, or all logging, there would result in logging companies buying more land, which in turn would keep that land from being converted to vacation houses, roads, parking lots, and strip malls. Matera spoke highly of a Greenfield-based group that has a web site at www.MassForestRescue.org. The below photos show that group's members in the Valley last year. Photos by MassForestRescue.org. The below photos of forest in Dummerston, Vermont were taken on January 28 (the first photo) and February 4 by Eesha Williams. Dummerston borders Brattleboro. The photo that shows fewer trees is of an area that was selectively (not clearcut) logged last year. The other photo shows an area that was selectively logged three years ago. In other news from the Valley, on February 2, activists in Westmoreland, New Hampshire announced they had permanently protected 22 acres of farmland from development. Westmoreland is about two miles from Brattleboro. The activists have a web site at www.MonadnockConservancy.org. In other news from the Valley, in Northampton on January 29, the out-of-state corporate chain owner of the Daily Hampshire Gazette newspaper fired the newspaper's editor, Jeff Good. “Publisher Mike Rifanburg informed me this week that I am being fired. The reason: I advocated for transparency and fair pay for our female colleagues at the Daily Hampshire Gazette and its sister publications,” Good said in an e-mail to his co-workers. Submitted by Anonymous on Tue, 02/06/2018 - 09:34. Selective logging or thinning degrades forest ecosystems and inhibits the ability of forests to draw down carbon to reduce and reverse climate change. Standing forests have managed themselves successfully for 300 million years. Up until this climate emergency, humans have assimilated a “ resource extraction” mentality. We must see the forest as a living biosphere, with a heart and mind. Everything lives in balance within. Thinning forests interferes with their above and sub-soil networks’ communications, which assist this ecosystem by preventing and fighting disease and insect infestation, and providing life support/nutrition for the rest of the forest community... Humans are destroying MA, NH, VT and (what is left of) Maine forests with heavy equipment, called “feller bunchers.” Meanwhile forests have more financial value standing. We need YOUR help to protect forests in the Northeast! We have friends around the country working together to preserve standing forests as “forever wild”. Help us Save forests/Save the Climate! 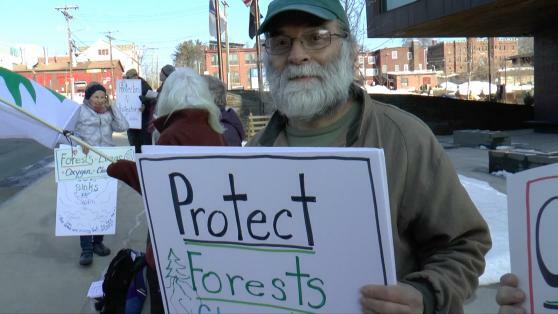 Join our Forest Protectors at Mass. Forest Rescue Campaign-www.massforestrescue.org May the forests be with you!